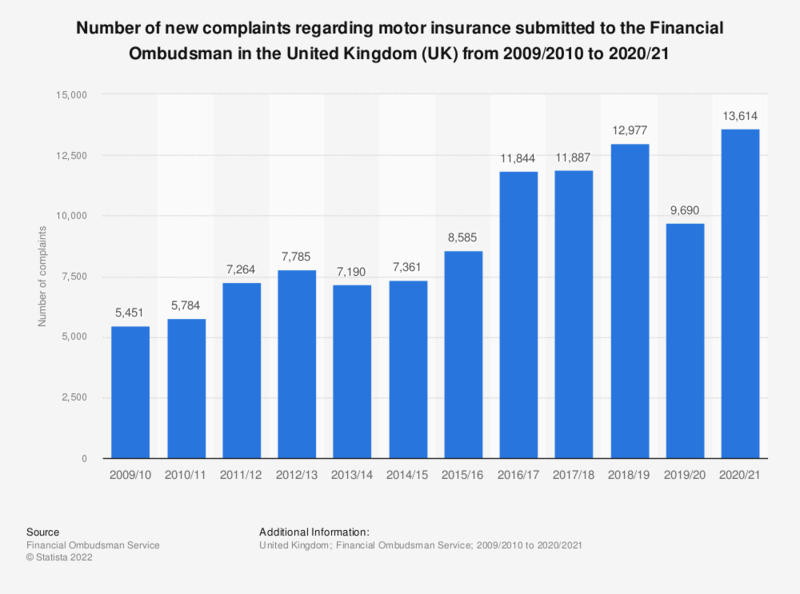 This statistic illustrates the number of complaints submitted to the Financial Ombudsman regarding motor insurance related issues in the United Kingdom (UK) between the financial years of 2009/2010 and 2017/2018. It can be seen that the number of motor insurance complaints increased overall during the period under observation, reaching a total of nearly 11.9 thousand as of 2017/2018. The smallest number of complaints during this period were found in 2009/2010, when a total of over 5.4 thousand complaints were recorded. Financial year ending 31st of March. Everything On "Financial complaints and compensation in the United Kingdom" in One Document: Edited and Divided into Handy Chapters. Including Detailed References. Statistics on "Financial complaints and compensation in the United Kingdom"
Life insurance in the U.S.
Insurance industry in the U.S.
United Kingdom insurance brokers: Which area of motor business do you expect to grow fastest in 2015? United Kingdom insurance brokers: which reforms had or will have the biggest impact on motor insurance? United Kingdom insurance brokers: Which of the following factors has had the greatest impact on pricing in the motor insurance sector in the past five years (as of 2014)? United Kingdom insurance brokers: Which of the following factors will have the greatest impact on pricing in the motor insurance sector in the next five years (as of 2014)? United Kingdom insurance brokers: What is driving the regulatory scrutiny of the motor insurance market? United Kingdom insurance brokers: Does telematics have the power to transform the UK motor insurance industry? United Kingdom insurance brokers: Are you aware of the DVLA's MyLicence initiative? United Kingdom insurance brokers: what factors would do most to lower the cost of motor insurance? United Kingdom: How many possible alternative motor insurance suppliers did you consider before purchasing?